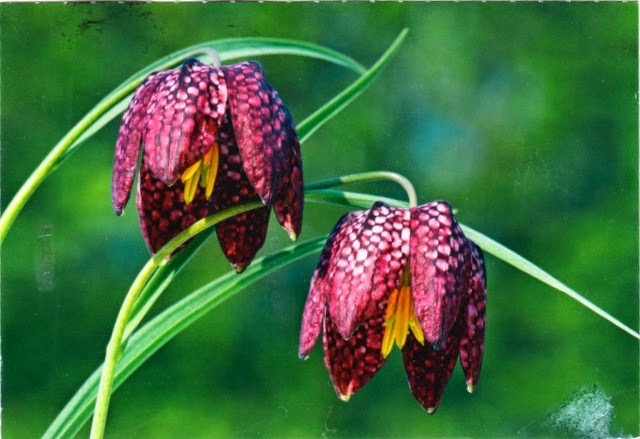 Postcard DE-3953158 from Germany shows Fritillaria meleagris (Schachblume in German), a species of flowering plant native to Europa in the family Liliaceae. It is originally known as snake's head, probably because of its snakelike appearance of the nodding flower heads on their long stems. It is also known as chess flower, checkered lily, or checkered daffodil because the flower has a checkered pattern in purple, or sometimes in pure white. Usually grown in grasslands and river meadows at altitudes below 800 meters or 2,625 feet, it blossoms from March to May.